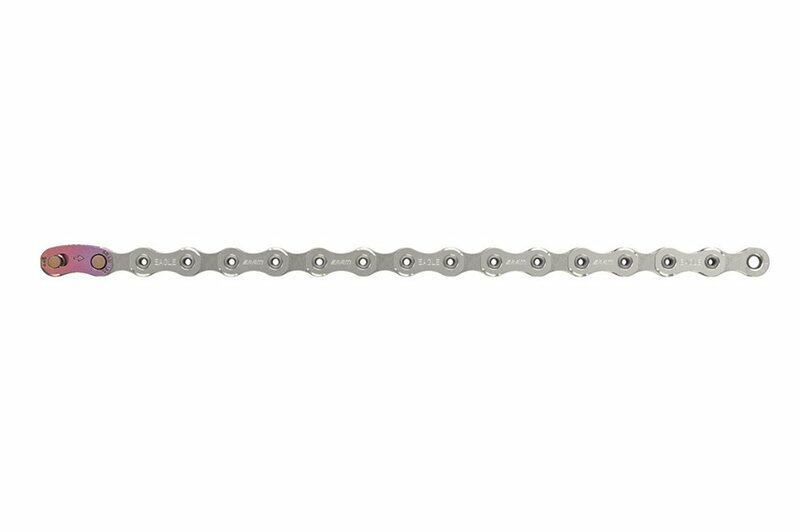 The key factor in the Eagle X01 drivetrains smooth, durable, and silent performance is all the new technologies going into the PC-X01 Eagle 12 speed chain. For starters, Flowlink removes all the hard edges and chamfers from the inner plates leaving a completely smooth radius. It now runs much quieter and reduces wear on other components it contacts such as cassettes and chainrings. The durability theme continues with Hard Chrome finishing treatment giving the chain four times the chain wear resistance of other SRAM chains. The Eagle chain has been completely re-engineered, and is produced with new manufacturing technology. All-new Eagle Power Lock chain connector with FLOWLINK technology provides better chain-guiding and increased longevity. The PC-1290 Eagle chain, with the aid of the HARD CHROME finishing treatment, is the quietest, strongest and most wear-resistant chain in the world. This is a terrific chain, cut back to 112 links it weighs 234g. 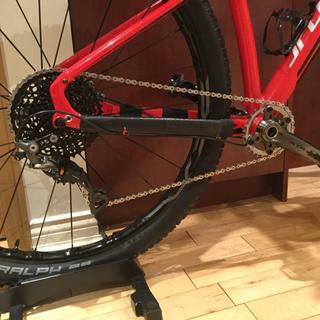 I’m using it to connect an XTR 9020 crankset with a one-up 30T chainring to an 1195 X01 11 speed 10-42 cassette via a shimano XTR M9000 GS derailleur & shifter. Oh yeah I almost forgot the Lindarets Goat Link! It works really well, much better than the 11sp XX1 chain I was using before. Its very light, shifting is silky smooth, on the trail it is SILENT! & I can backpedal as fast and as long as I wish, it wont slip down the cassette. Have I found drivetrain Nirvana? Only time will tell but for now I’m living the dream. This is my third PC-X01, and I have been very happy with there durability and reliability. I am about 205 lbs with gear and I do a lot of standing pedaling and the chains have never failed me (knock on wood) and have lasted longer than others. Bought this after I demo'd a X01 drivetrain at a local trail. I am putting on an Eagle GX drivetrain. It will be part of a slow upgradw process as I wear through components, but the X01 system was awesome, smooth, and quiet (even on a demo bike). Its a chain... it works well. Use and replace as needed. Upgraded to the 1X12 and this is required. Love the setup! It´s modern. I Chanx10 for this.ge my 2x10 for this. I want test in montains. Nice product, the colorfull link is cool! This chain looks identical to the XX1 version except color. If you read carefully the specs quote the weight for the Groupset. Can someone confirm this is the case? BEST ANSWER: I’m using both (two diff bikes) and have not noticed a difference other than color.